Step 1: Go to the Google 3D Warehouse and type in "MKD." You should see designs for the mkSolaire, Sunset Breezehouse, and Glidehouse. Nice. These files are for use with SketchUp. Download the design you want for your home. Step 2: Download a free copy of Google SketchUp and use SketchUp to open the file you downloaded in Step 1. Using SketchUp, modify the landscape of your home. (I must admit, I'm still learning how to use this program and do this step). Step 3: Download a free copy of Google Earth. Find the location of your site. 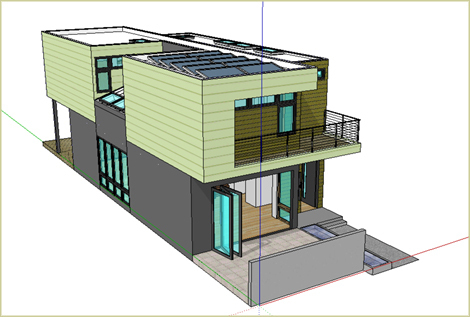 Plop your SketchUp model on the site that you've located. That's the process. It's a pretty cool mashup allowing you to envision the land of your dreams with the home of your dreams. If anyone does anything cool, drop a line below. I cant find the models, i dont think they are available anymore but if you have them can you upload them for me? I also can't find the models. I would really like to use these designs in a precedent study I'm doing for another project and would very much so love the use of those models.